Read the entire Supplementary Appeal. The security operations in Northern Rakhine State in Myanmar in response to the attacks on police and military posts launched on 25 August 2017 by the Arakan Rohingya Salvation Army (ARSA) triggered the largest and swiftest refugee exodus witnessed in the region in recent decades. 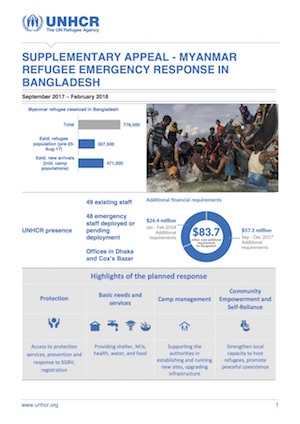 With numbers at times reaching 20,000 people per day, 471,000 Rohingyas are estimate to have, as of the date of issuance of this appeal, sought safety in Bangladesh, principally in Cox’s Bazar District. There, they have joined 33,000 Rohingyas registered as refugees in the camps in Kutupalong and Nayapar, as well as an estimated 274,500 others, mainly in so-called makeshift camps, and who are denoted as “undocumented Myanmar nationals”.